Facebook has just launched a tool that’ll formalize — and improve — a service that its platform was already being widely used for. Facebook’s new tool will let people register on Facebook if they’re willing to donate blood, and they will be notified if someone needs blood in their immediate vicinity. From the looks of the picture shared, people who’re in need of blood can create a special post on Facebook which will list out the blood-type, their contact numbers, and the location where they need blood. Donors who’ve registered with Facebook will be notified when a request is created close to them. Zuckerberg says the idea was conceived by Indian-origin Facebook product manager Hema Budaraju during a company hackathon. Budaraju’s father had been diagnosed with cancer five years ago, and needed blood transfusions every day for a week. She had to contact friends and family in order to be able to find donors, and thought she could harness the power of Facebook to make things simpler. 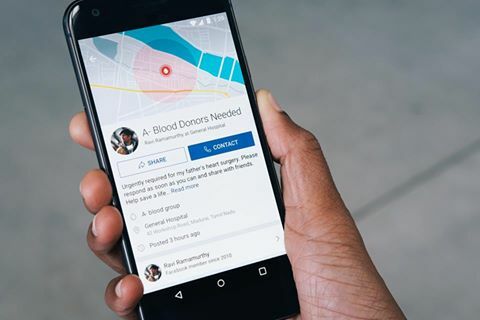 Facebook already is being used to connect blood donors and those who need transfusions — city-based groups are often chock-full with requests for blood, as are posts which ask readers to share them within their networks. By formalizing this process, Facebook will likely make it much easier to connect these people. It can also help recipients save precious time, which can be critical in health emergencies. Facebook’s billion-strong network can now also save lives.